It is widely known that once racing enters the blood, it can become a consuming desire that lasts for a lifetime. Nearly three-quarters of a century ago, a teenage Hershel McGriff drove his father’s 1940 Hudson to a 12th place finish at Portland Speedway. On May 5, 2018, a few months after turning the 90th page of a storied book of accomplishments, the NASCAR Hall of Fame nominee will remarkably put the helmet on and fasten the belts to take another record-setting green flag. The event in which he will participate is with a familiar series at a familiar track, the NASCAR K&N Pro Series West Port of Tucson Twin 100s. McGriff is third on the series all-time win list with 34, won the Most Popular Driver award for 12 consecutive years and was the 1986 champion. In all, he has started 266 K&N West races, three of them at the 3/8-mile Tucson Speedway. How did this opportunity come about? McGriff’s son Hershel Jr., a veteran competitor in his own right over multiple years, explained. Since then, plans and preparations have been in the works. An offer to furnish a competitive car and crew was something that Hershel Sr., maintaining excellent health and physical stamina, couldn’t turn down. Additional support for his iconic No. 04 will be provided by South Point Casino owned by Michael Gaughan, father of NASCAR veteran and two-time K&N West champion Brendan Gaughan. During the 2001 season, McGriff drove as a teammate to Gaughan under the Bill McAnally Racing banner. While it will be his first time in the newer composite-bodied style of stock cars, McGriff has already returned to the racing surface on a couple occasions in an older steel-bodied car to get some practice. That included a 50-lap run with impressive and consistent lap times under the tutelage of his son. McGriff’s experience reads like an encyclopedia and is the dream of any motorsports enthusiast or historian. In addition to his K&N West prominence, McGriff won the inaugural Pan American Road Race in 1950, which included NASCAR founder Bill France Sr. in the field. Shortly after, McGriff drove his racecar, literally across the country’s highways and backroads, from Portland to Darlington, South Carolina to partake in the first Southern 500 and finished ninth. He made 86 more Cup (then known as Grand National) starts and achieved four victories. He also participated twice in the prestigious and enduring 24 Hours of Le Mans in France. While a majority of young racers that will be competing on this particular Saturday night were not even considering racing stock cars at the time of McGriff’s last start in 2012, the driver that finished runner-up in that race recalls him being in the field. Driving for the rivaling Bob Bruncati-owned team, Thorn has returned to the K&N West circuit full time in 2018. The Bakersfield, California resident shared his thoughts about looking forward to running alongside the legend once again at Tucson. Perhaps the most special part about this upcoming race day is the fact that McGriff will be one of three generations from his family competing in the same night, a feat that more than likely has never been matched in NASCAR’s history. Hershel Jr. stepped out of the driver’s seat for approximately 20 years and shifted to assisting other competitors when the family relocated from Oregon to Arizona. Track president John Lashley offered him a ride in an Outlaw Late Model class that was launched for the 2018 season. He went out and won the inaugural feature. 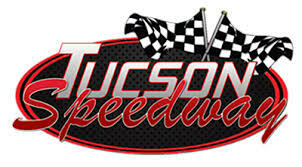 His wife Shelly has also been actively involved in many aspects of Tucson Speedway’s operation and promotions. Hershel Sr.’s granddaughter Mariah McGriff has been gaining experience in recent years and will pull double duty between the NASCAR Whelen All-American Series headlining Super Late Model division and Pro Stocks. One of the all-time best from the NASCAR Camping World Truck Series, Ron Hornaday Jr., will also be on hand as the Grand Marshal for the event. Hornaday and McGriff competed for wins against each other on the West Series circuit during the early to mid-1990s. 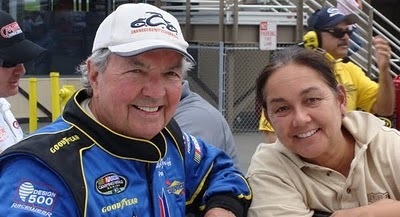 Hershel Sr.’s involvement will not only consist of being behind the wheel and watching his family race. The National Anthem will be performed by none other than himself on his trombone. Once each 100-lap race’s checkered flags fall, McGriff will not be taking it easy by any means. Early Sunday morning he will be hopping on a plane to Pennsylvania with Kenny Clapp, a former NASCAR director and creator of the West Coast Stock Car Hall of Fame, and will be joining in for a week’s worth of festivities toward Greensboro, North Carolina as part of the annual Kyle Petty Ride Across America motorcycle charity event. “I’m doing something all the time, otherwise I wouldn’t be in the shape I’m in,” McGriff, who works out 30 to 45 minutes a few times a week, mentioned. It’s McGriff’s ability to remain sharp and active over the years that makes his age just a number. It has also instilled continued confidence that he will be ready come race day. When asked what would be a successful outcome, McGriff answered with one word in which almost any other race car driver would do the same. 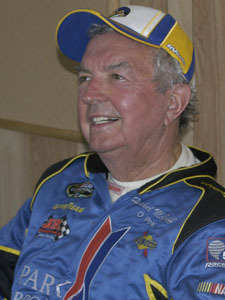 At 83 years old, Hershel McGriff said he isn’t ready to retire. So when the Arizona copper mine he helped run for 25 years was sold in 2010, McGriff turned his attention back to racing. 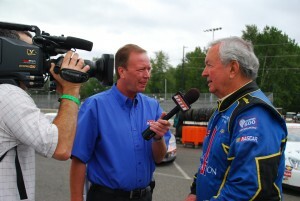 He’s scheduled to compete in the three road course events on the 2011 NASCAR K&N Pro Series West schedule. McGriff’s first race of the season was at Miller Motorsports Park in Tooele, Utah on April 30. He moved from 32nd on the grid to the top 10, but ended up finishing 16th after a last-lap incident put him off course. In addition to those three races, McGriff plans to run the entire Great American Stockcar Series (GASS), a rent-a-racer program for mature drivers. “Racing is just something to do to keep busy,” he said, explaining that the emphasis will be on the K&N series, while the ride in the GASS program will help him buff the rust off his skills behind the wheel. Even in retirement, keeping busy hasn’t been much of a problem for NASCAR’s most senior driver. The grand old man of motorsports is up before dawn, running with his dog or getting ready for a three-time-a-week pilates class. “When I was working at the mine and things got slow, I’d jump on the bike and ride three miles up hill…it is a three-degree grade. It would take about a half-hour round-trip, but coming down was a lot faster than going up. After morning exercise, McGriff is off running errands, often on an almost 45-mile round trip to his son’s racecar shop, to consult, shag parts or check on how preparations are coming for the next race. Hershel McGriff Jr. inherited his father’s love of motorsports, and made a name for himself in the Pacific Northwest as a driver, builder and crew chief, before joining his dad in Arizona and opening a car preparation shop. For his dad, it’s always been about the family. It was caring for his young family that influenced him to give up racing at the pinnacle of his career…and it is family that has helped bring him back to the sport he loves. “Now I’m racing to have fun,” he said. Don’t interpret the “fun” part to mean McGriff is out on the track just to put down laps and sign autographs. His most recent return to racing began in 2009, when he ran the road course at Portland (Ore.) International Raceway. It was a victory tour of sorts. He returned to the track, having won the last time NASCAR’s premier West Coast division competed there in the mid 1980s. For fans who remembered him in his prime, McGriff remains a living legend among stock car racing’s elite. He’s a crowd favorite because he has always been willing to stay late to sign autographs, to let a youngster sit behind the wheel of his racecar or pose for photos or give interviews to the media – except at that Portland race. When the checkered flag fell in 2009 to give Jim Inglebright the win, McGriff resisted requests to show up at the media center for a post-race interview. He said “the attention should be on the winner, not someone who was mid-field” when the race ended. McGriff left the media center after a couple of questions and returned to the fans still milling around his car. He is so well thought of that when NASCAR celebrated its 50th anniversary in 1998, it named McGriff among its 50 greatest drivers of all time – a list that includes names such as Darrell Waltrip, David Pearson, Dale Earnhardt, Lee and Richard Petty and the Flock brothers. McGriff had the potential to be a champion had he stayed with the sport, according to Petty. He said McGriff was good enough that he always raced in good equipment. But good drivers make good racers, no matter where they are racing or what they are in…even if the race is a bit off the beaten track. Take for instance, the win that put McGriff’s name in national headlines – in the first Carrera Pan American Mexico Road Race in 1950. More than anything else about his greatest victory, McGriff remembers the unforgiving Mexican desert. It was the third day out and McGriff was hot and near exhaustion. The sun was beating down on his Oldsmobile coupe. McGriff, then a brash 22-year-old from Portland, Ore., and co-driver Ray Elliott were reaching the mid-point of the six-day race to open a new highway down the middle of Mexico. “The Oldsmobile speedometer went to 110,” McGriff said. “I just kept my foot on (the accelerator) and we kept the needle right on the bottom of the gauge. Those were heady days for the young driver, who seemed to be able to run the wheels off almost anything into which he strapped himself. In 1949, McGriff was the Northwest Stock Car Association champion, with eight victories in 12 starts in the series. The series raced everywhere it could find a piece of dirt and a ticket-taker. Then Elliott showed him a magazine story about the upcoming road race in Mexico. The country was trying to entice tourists by heralding its new paved artery, and its government decided to christen the route with a race from Cuidad Juarez, just south of the U.S. border, to El Ocotal, on the edge of Guatemala — 2,178 miles over six days. “De frontera a frontera” — border to border. The entry fee was nearly $600, McGriff recalled. At the time, he was earning 60 cents an hour driving a tow truck. McGriff, Elliott and Roy Sundstrom – listed as the owner/entrant – strapped a pickup fuel tank into the car and bought military surplus seat belts from an aircraft salvage company. Then they tossed four extra wheels and tires into the Olds and headed south. The race drew 132 cars and an international field of drivers. Some were famous. Others were waiting their turn. Formula One’s Piero Tarufi was entered in an Alfa Romeo, sponsored by the Automobile Club of Italy. NASCAR founder Bill France was entered in a “bathtub” Nash, “the official pace car of NASCAR.” He was co-driving with stock-car legend Curtis Turner. Bob and Fonty Flock – soon to become famous behind the wheel of stock cars – shared a 1949 Lincoln. And off- road legend Bill Stroppe was in another Lincoln. 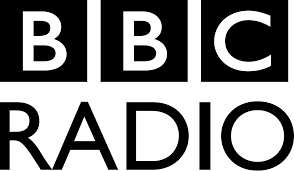 The race was run in a series of timed legs. Mechanical failures from the high speeds and wrecks from blown tires took its toll on the field. And by the end of the fifth day, McGriff was out of tires. “I knew the last stage was mostly unpaved,” he said. “I found a General Tire dealer and he had something that was a really heavy-duty, six-ply tire, like something you might find on a light truck. After more than 1,000 miles of driving on pavement, McGriff was in his element. Portland Speedway, where he learned to race, was still a dirt track and McGriff had been trained to drive log trucks on forest roads. He attacked the final 107 miles of gravel road with the tail end of his Olds hung out around the corners and the gravel flying behind him. Although the team never won a race stage and was never the fastest at the end of any day, it crossed the line at El Ocotal 76 seconds ahead of its nearest rival. The winner’s purse was 150,000 pesos, about $17,000. Today, there are only memories and a notation in the record book left of the first race down Mexico. The Oldsmobile is gone. McGriff raced it for a few more seasons until it was “just a used up old race car.” He sold it to a young man who rolled it, and the car ended up in a wrecking yard, where it sat for a couple of years, gathering rust and moss. McGriff said the prize money was not the best part of winning. It also moved his career to national prominence. Bill France Sr., was looking for a fresh-faced, articulate young driver who could come east and help sell his new stock-car racing series. McGriff was just the man for the job. 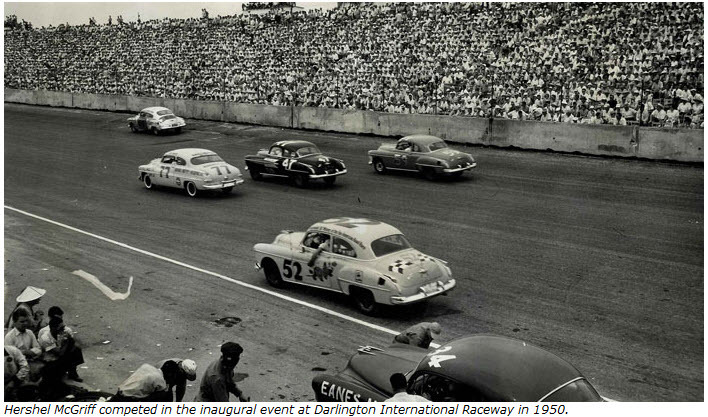 McGriff drove his Oldsmobile across the country to race in the first event in Darlington, S.C., NASCAR’s first dedicated speedway, in the Southern 500. When the race was over, he drove the Olds back to Portland. France must have like what he saw. In the middle of 1954, he asked McGriff to run the rest of the season with NASCAR. McGriff ran 24 races, winning four of the final nine events. In spite of his short season, McGriff finished sixth in season points. But by the end of 1954, he’d had enough. Lou Figaro, a good friend of McGriff’s, was killed in the last race of the season at North Wilksboro, N.C. McGriff won that race, then decided he wanted to come home to his wife and young family. He left on the table an offer to drive the new Chrysler 300 that would dominate the next two seasons of NASCAR racing. Back home in Oregon, McGriff built a career in the lumber business, and did not get back into a racecar for more than 14 years. When he did, it did not take long for the magic to return. He took on the tough NASCAR Late Model Division when he returned in 1968. He ran the NASCAR K&N Pro Series West, then known as the NASCAR Winston West Series, against such drivers as Parnelli Jones and Ron Hornaday Sr.
McGriff went on to win the series championship in 1986 at the age of 58. When the old Riverside Raceway in Southern California closed to make way for urban sprawl, McGriff had a record 14 victories on the road course. In addition to four wins in NASCAR’s premier series, McGriff raced twice at Le Mans (once in a Dodge stock car), and in Australia and Japan. Apparently there was nothing like a full-sized American stock car racing against a field of dainty European sports cars to attract a bit of attention. The team went to France with a selection of fully-prepared, high-compression race engines, designed to operate on high octane fuel. Not nearly as long as McGriff…which brings up one final issue. “People ask me what I’m trying to prove by getting in a car at my age,” he said. 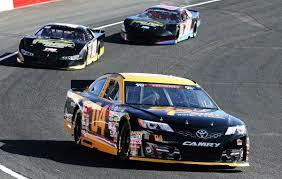 Now in its 57th season, the NASCAR K&N Pro Series West can be traced back to 1954, when NASCAR came to the West Coast and began sanctioning the Pacific Coast Late Model circuit. The series visited California tracks such as the Oakland Speedway in Oakland; the Balboa Speedway in San Diego; the Bay Meadows Speedway in San Mateo; and the Carrell Speedway in Gardena. The 1954 series schedule featured nine races, with the first event taking place at the 5/8-mile Oakland Speedway. The track was known as “The Oakland Wall” because of an incredible 65-degree banking used for some events. The man on pole for that race was the then twenty-six-year-old, Hershel McGriff (born on December 14, 1927). However Hershel McGriff’s career began nine years earlier in September of 1945 — the first race in America after World War II. He went on to become the driver with the most wins of any Winston West active competitor (35 victories). He won the 1950 Mexican Road Race and competed in the first Southern 500 at Darlington International Raceway. McGriff also competed in a stock car at LeMans, France, in Australia and in Japan. McGriff won the 1986 NASCAR Winston West Series Championship and tops the list of pole awards in Winston West Series poles with thirty-five. Additionally, Hershel McGriff was voted ‘Most Popular Driver’ twelve times over his long NASCAR career. Last year Hershel returned to the series now known as the K&N Pro Series West after an eight year absence. On 06/20/2009, he attempted to qualify for the Bennett Lane Winery ‘200’ (Infineon Raceway). Although he can boast of three wins at the track (1983, 1985, 1987), this time round McGriff failed to quality. Unfazed, McGriff returned to his home track, the Portland International Raceway on 07/18/2009, qualified 21st and finished 13th. He also raced the road course at Miller Motorsports Park. A flat tire, two laps from the finish, relegated the 81-year-old Hershel McGriff to a 19th-place finish. NASCAR Race Mom: Which race is most memorable to you and why? Hershel McGriff : Probably the 1950 Pan American Road Race in Mexico. It was by far my greatest achievement because there were entries from countries all around the world. It was quite an experience at 22 years of age. I won by only 76 seconds after driving 2,178 miles. NASCAR Race Mom: How has racing changed from when you started your stock car career in September of 1945 at the Portland Speedway to your last race there on July 19, 2009? Hershel McGriff : Imagine taking your street car and trying to compete with a Cup car. We all drove the same kind of equipment which has gradually gotten better over the years. Thankfully today, we have safer cars, much better technology, and much more knowledgeable people. NASCAR Race Mom: What is the best change NASCAR has made in this series during your career? Hershel McGriff : One thing I miss in the West series is we used to run dirt one night and blacktop the next with the same car. We had some great shows. Another great change is the how NASCAR has created the opportunity for young drivers to work their way up through the ranks. 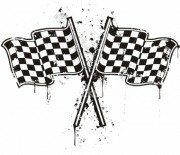 NASCAR Race Mom: What are your goals for your Portland International Raceway race on July 18, 2010? Hershel McGriff : A top six would make me feel pretty good.